An elderly man was found dead near an Eastside backyard Friday afternoon after he was attacked by dogs, the Jacksonville Sheriff's Office said. Police were called about 4:30 p.m. to investigate after a man was found dead along the fence line of a home on Jessie Street. Information gathered by investigators indicated that the man had been attacked by an animal, said JSO Sgt. Chuck Ford. Ford said it is unclear what the victim was doing prior to the attack, but he was on the property along the Franklin Street Apartments, which face the back of the home on Jessie Street. 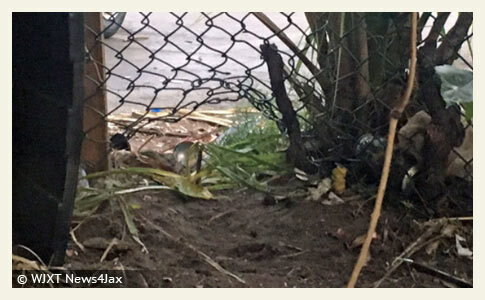 Investigators said they discovered a hole in the property's chain-link fence that they believe the dogs could have gotten through. The victim was found on the ground in the backyard of the house, inside the fence line, Ford said. He said the fence is secure, but there are spots with holes in it. Four mixed-breed dogs were taken to Animal Care and Protection Services to be evaluated. It is unknown how many of the dogs attacked the victim, Ford said. "The dogs were taken. They were secured," Ford said. "It'll be much easier to do there than at the scene." 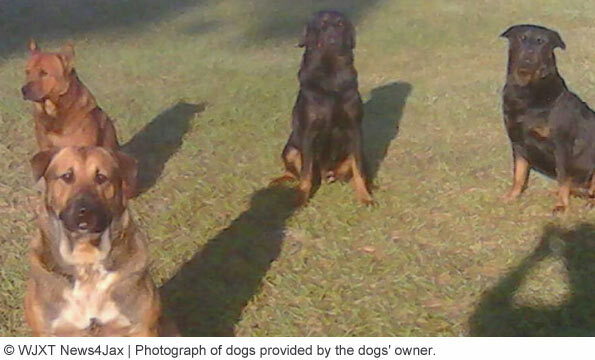 The owner of the dogs, Lephus Felton, told News4Jax that the dogs are trained to protect his home. "My dogs don't mess with nobody. My dogs are trained to protect this yard. I have signs and all that, 'Beware of Dogs' signs all over. You know? There's no way in the world my dog is vicious," Felton said. He said one is a ROTTWEILER, BUT THE OTHER THREE ARE MIXED BREEDS CONSISTING OF ROTTWEILER, GERMAN SHEPHERD AND CHOW CHOW. Felton said the dogs are trained and obey orders, but the problem is he wasn’t home at the time of the attack. “I was gone for 30 minutes,” Felton said. Felton said he's upset about what happened to the man. Still, he was defiant that his dogs would not attack without being provoked. "He had to be antagonizing my dogs to be pulled under there because, even the police say, because he got pulled underneath. So he had to stick his hands under there, so that's when they grabbed him, I guess," Felton said. "My dogs ain't no vicious dogs. They're vicious to protect this yard. That's their job. It's like the police have dogs to protect them, you know? That's how they're trained." The victim's name has not yet been released. The Sheriff's Office continues to investigate. This is so terrible!!!! How can this continue to happen???! I'm so angry! "The fence is secure but there are holes in it?" Does that mean it won't fall down if you blow on it? Let's see , we have....4 non-vicious security bred dogs that have human brains so they KNOW they are only supposed to protect the fenced yard, a fence with holes in it, an elderly man walking down the street. Who wants to walk down the street to test the owner's theory? Anyone? I would love to see evidence that any of those four dogs were formally trained to do anything. I highly doubt that those dogs had "police" training, or were trained as guard dogs. Were are the certificates? Where's the proof that any of those dogs had obedience, let alone "protection" training? Mouthing off that your dogs were trained does not excuse having a pack of vicious dogs patrolling your property. The animals killed a human being, and the mentality is, the vicious, but trained vicious dogs, were provoked. Does anyone else see how illogical this is? This guy is not apologetic, he doesn't care about the victim AT ALL, and he's probably going to get his maulers back!